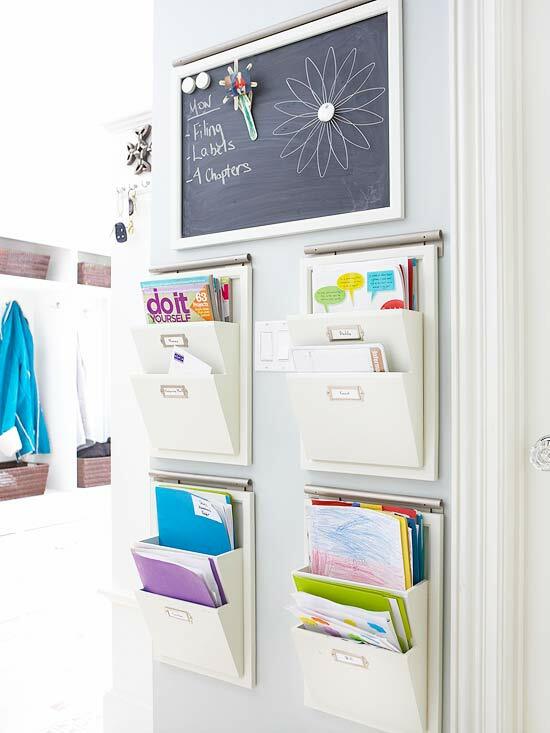 Get Inspired: 11 Ways to Spring into Organizing! Yesterday, the sun came out. HUGE HAPPY EAR-TO-EAR CAN’T-WIPE-THE-GRIN-OFF-MY-FACE SMILE! I love when the sun comes out here in the NW! 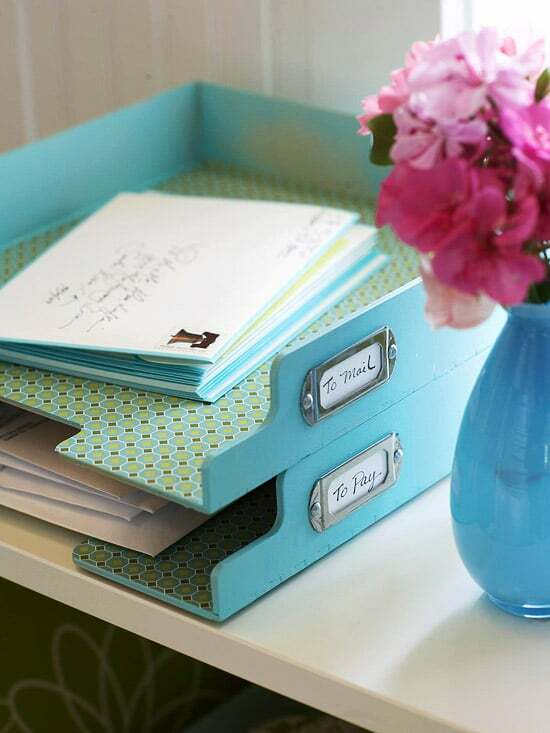 The sun totally inspired me to think about spring cleaning and wanting to organize everything! Bright sun clearly motivates and energizes me. I think I should move to San Diego or something because we clearly are bright sun deprived here in Seattle. Sometimes you just need something new to inspire you this time of year. 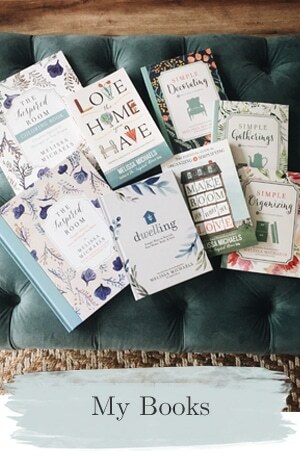 Anyway, along with a welcome spring dose of Vitamin D all around, here is a round up of 11 pics and links that completely got me in the mood for spring organizing all through THE ENTIRE HOUSE! 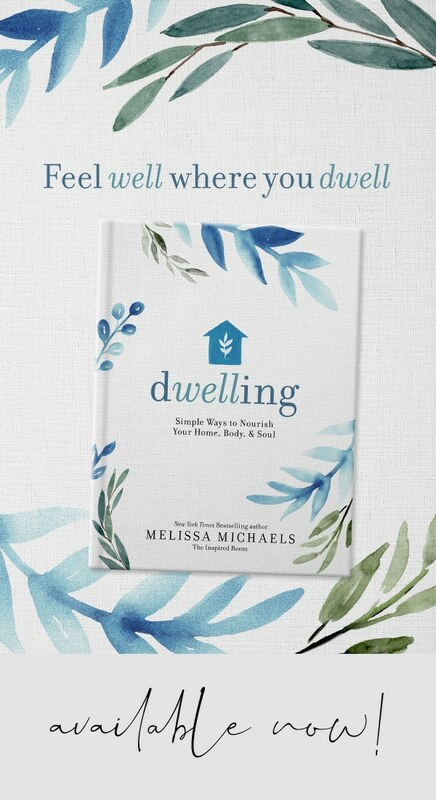 Maybe you’ll be inspired to dive into a spring organizing project, too? Ready, set, GO! Which picture will inspire you the most? So, tell us! Which picture inspired you the MOST? 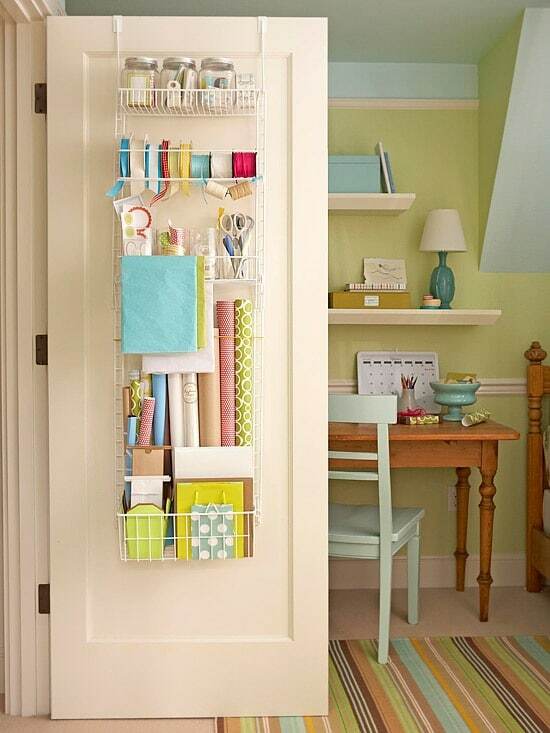 What is your next organizing project? Apparently organized spaces are my “happy place”! Thanks for giving me so many ways to travel there today. I can’t choose a favorite! Oh, to be so organized. Thanks for the much needed inspiration. Little by little…..
All of them! Ha! Sorry, I’m no help. I love clean, bright, organized spaces. And, regardless of budget it’s something everyone can do. I started reorganizing my office and then stopped in the middle of it. Yikes! 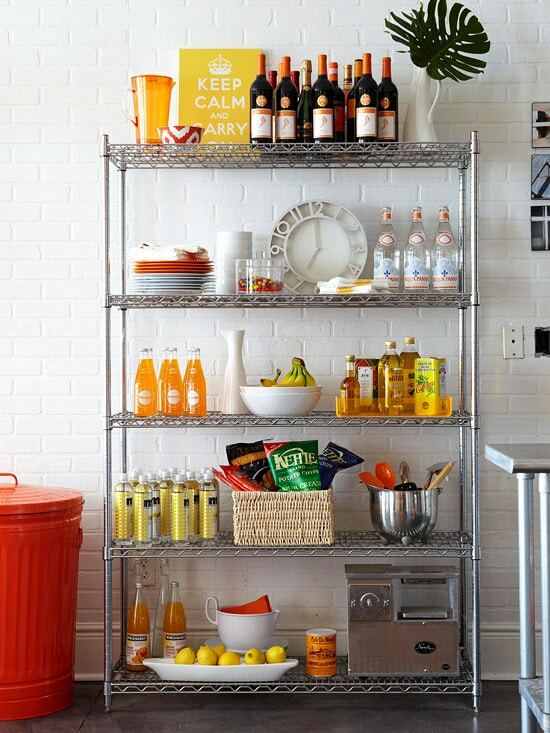 I love these organized spaces. 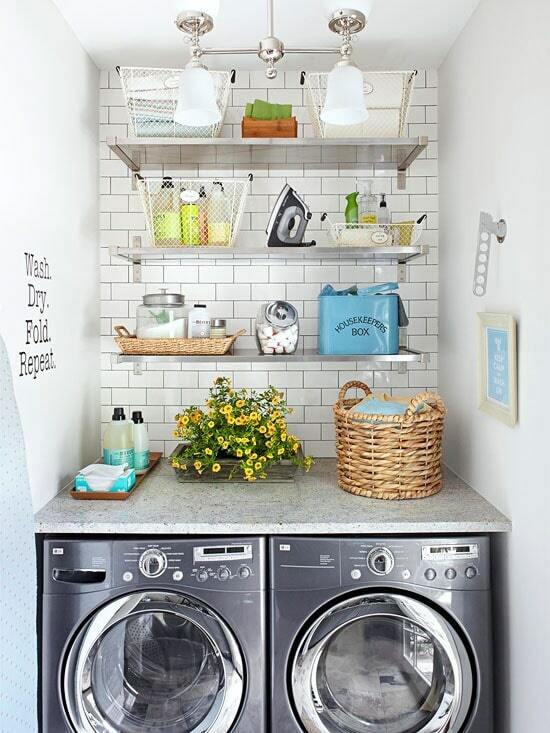 I am doing my laundry area this spring. Wall paper is on my mind. Thanks for the post. I love these ideas! 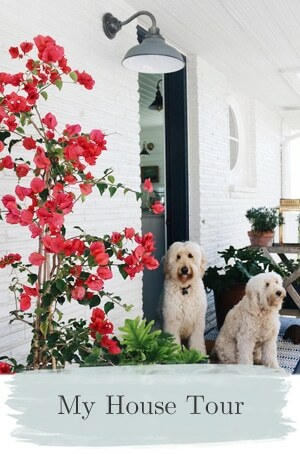 I am going to try & incorporate them into my home! Thanks. Since I pinned the last one a few weeks ago, I’d say that that one would make the most difference for me. The one problem is that the doors I want to use the idea on are hollow Core and that would require nailing at the very edges and that wouldn’t allow the door to close. It’s always something, though I can dream! So Glad that there’s been sun. HOpe that you get lots more. Pin all the things! 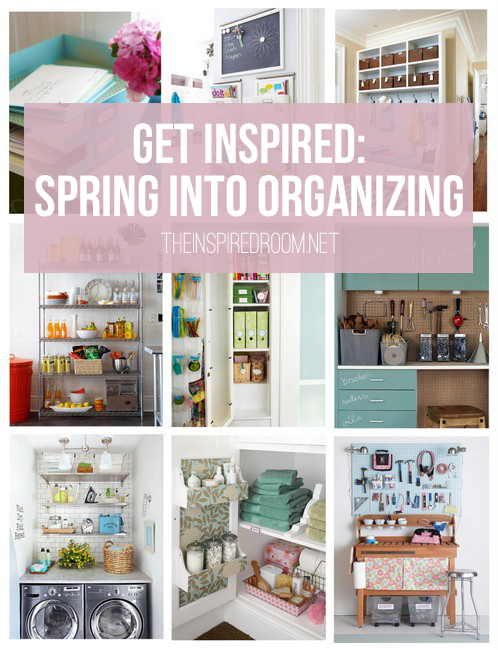 :) This post makes me excited for Spring- even the cleaning and organizing! 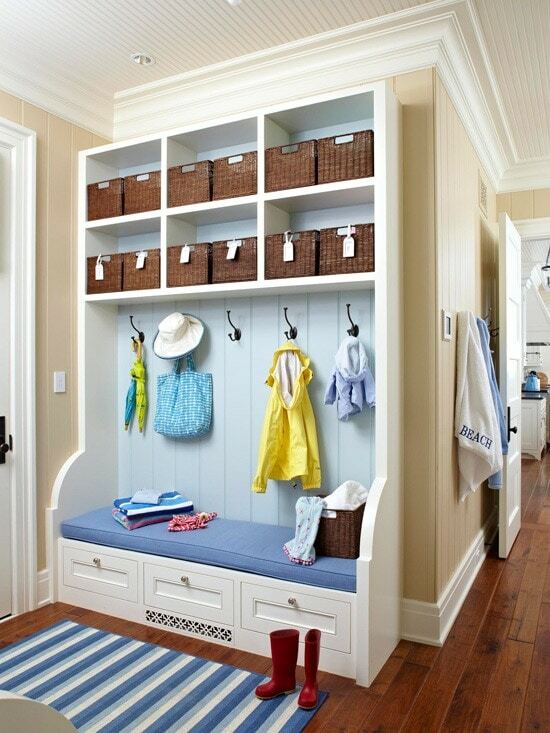 I think the mudroom/laundry projects are first on my list. Thanks for the boost. We seem to have had more dreary days than sunny lately here in Virginia, too, and I’m ready for the sunshine they’re predicting here for the weekend! My favorites are the laundry room, pantry, and bill-paying station. The sun is shining here in mid-Michigan, too, and I couldn’t be happier!!! These are all great ideas. 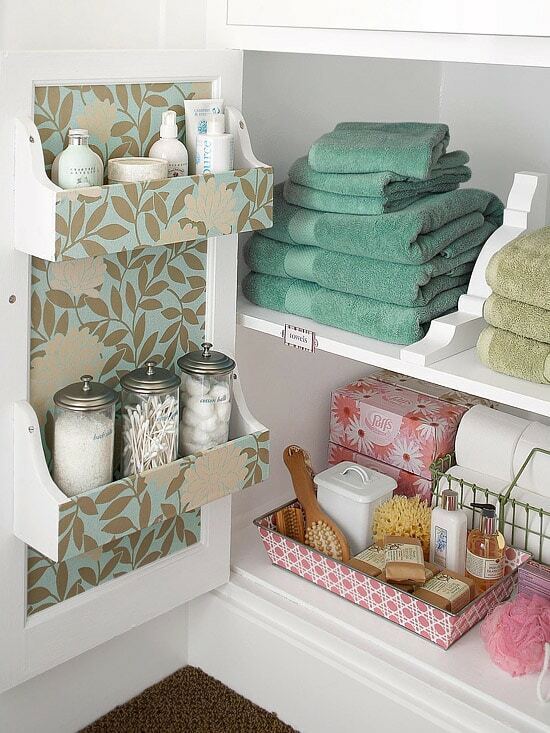 I like the bathroom storage or the wrapping station. I guess that is where I need my work. When I was a kid, I used to take an empty gift box and fashion dividers out of folded paper. I’d secure the dividers in the box with Scotch tape, then load in bits and bobs…crayons, pencils, erasers, paper fasteners, a tiny stapler. I am an organizer from way back. And you never lose the urge. My favorite is the laundry room. I have a generously sized laundry room, with a checkerboard floor and lots of storage. It’s pretty nice, but not as nice as the picture you posted…I think I need to get busy. Thanks for the inspiration! 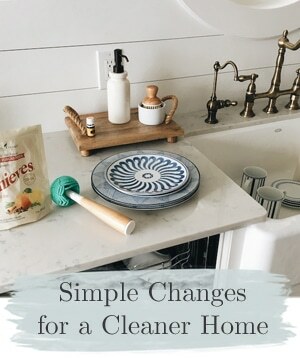 Spring cleaning and organizing is essential and it makes me feel so much better once everything is nice and put in the right place. All of the US bloggers are talking about spring coming which is funny because in Australia we are just heading into Autumn (we don’t call it “Fall”) and I am so happy because it has been too hot to do anything !!! Unfortuneatly mother nature does not seem to know it is not summer anymore because it is going to be hot for at least another week ! First I want to say I don’t think I can choose because I love all of the pictures. 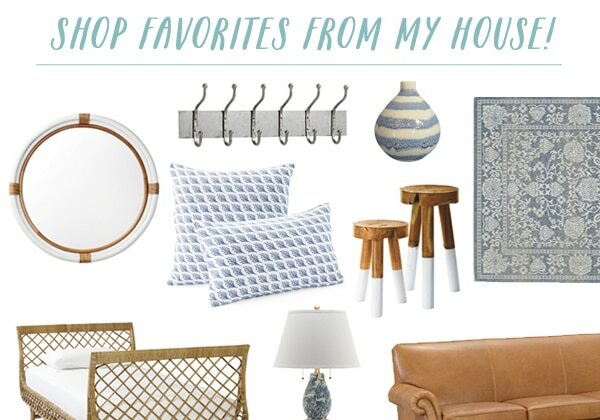 I think my favorite is the mud room. That is because I don’t have one but I have an idea for one inside my garage. Just had to mention I lived in the NW for three years and one day went to get my hair cut. I noticed women getting up from the hair dryers and looking out the front window. I thought, “Oh there has been a terrible accident out front.” I asked one of the hair dressers what had happened and she said, “Oh the sun has come out and you can see Mount Ranier.” I had moved there in November and had NEVER seen it yet so I got up again got my first sight of the pink topped bowl of icecream we knew as Mt. Rainy. It was gorgeous just like these pictures you posted. Another NW girl here who was lovin’ that sun yesterday. (Fingers crossed for the weekend!) I love the closet picture! 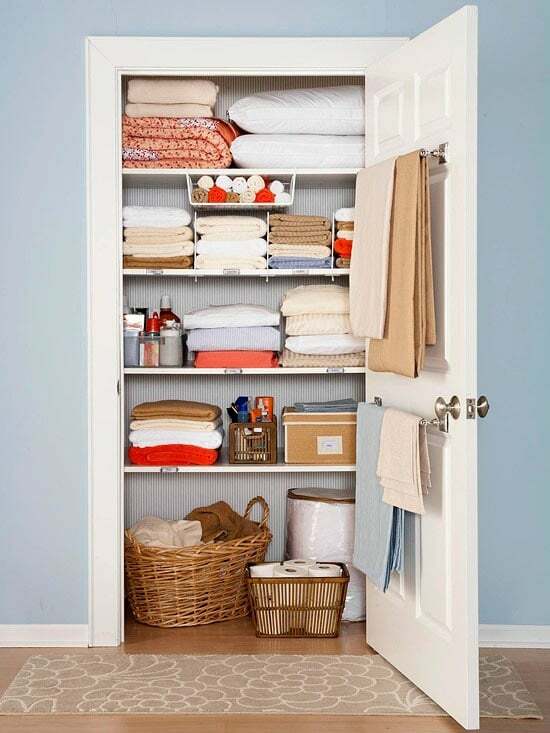 I’ve got closets on my mind and hope to tackle a few of them very soon. Yes, fingers crossed for the weekend!! We need more fun :-)!! I really want to go to Snohomish, by the way! I have never been! First Street in Snohomish is where you want to go. It is probably the cutest street ever! Lots of fun shops that would be right up your alley. Check out Joyworks especially! YAY! I’m definitely going to go….THANK YOU! These are all so awesome! I think someone should come do them all to my home right away. 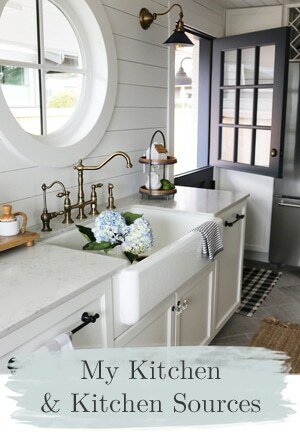 I loved the kitchen shelf! Everything looked so beautiful and organized! My next organizing project will definitely be my bedroom. It’s a mess and it really needs an overhaul! Also, in Seattle area and It is this time of year that my daily mantra becomes “I need a vacation to somewhere sunny” but if we have more days likes that I won’t be saying it this year. Every single one of my spaces needs touched by an organization fairy but i’ll start with the laundry “closet”. The inspiration picture made me want to cuten it up and make it happier. 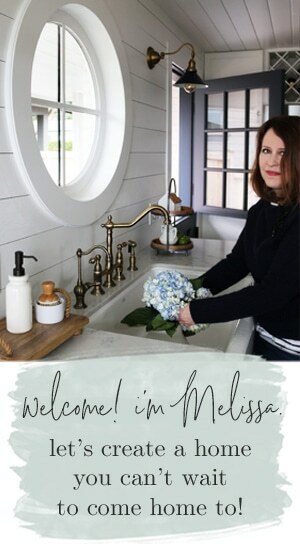 Melissa, One of my favorite things is to organize and when I looked at today’s posting it brought a smile to my face. Most of my time is spent assisting my (almost) 92 yr. old mom. This takes almost endless effort and usually there is not time for other things or people in my life. However!!! the good news….. Every few days or so I open your emails (which my husband stores in my ‘decor’ folder) and it brightens my day (or night). Thank you! Aw, thank you Joan! I’m happy to have a little part in your day brightening. You are a wonderful daughter to take such good care of your mom. Glad you have a little time for yourself, you deserve it! I was most inspired by the closet organization and bathroom storage pics. Beautiful inspiration photos. #9 Was my favorite. 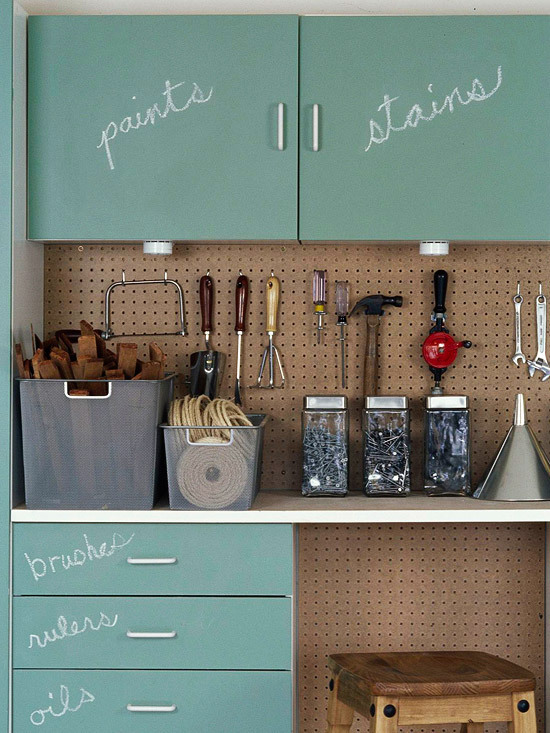 Chalkboard covered cabinets is a lot of fun and has a great texture. Now it’s time for spring cleaning to start. 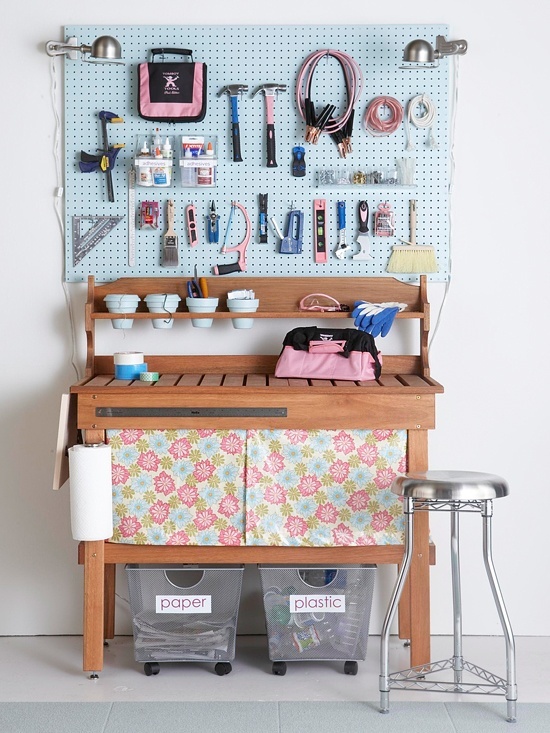 Love the pretty/feminine workshop area with the pinks and the blues! 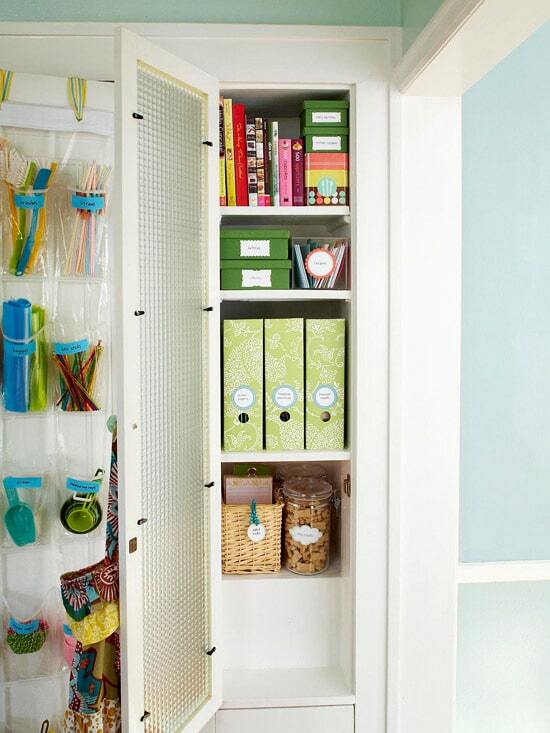 I can’t get enough of all your organization ideas! I think now I just need to get it in gear!